The Audi A4 is a supremely stylish sedan that delivers everything that you’d expect from a luxury vehicle and more. Not only does it have an unmistakable and eye-catching exterior design that is sure to make you the envy of the neighborhood but it also gets loaded with first-class technology and safety systems. Technology and safety systems that transform your everyday drive into a connected and confident pleasure cruise. 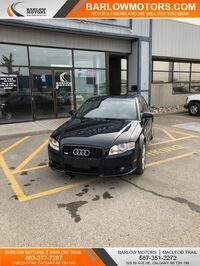 Keep reading to learn more about the impressive specs and features of a used Audi A4 right here and you can find the used Audi A4 you have been searching for at Barlow Motors in Calgary, AB today. Where Can I Find a Used Audi A4 Near Me? Barlow Motors in Calgary is your one-stop shop for all of your luxury vehicle needs no matter the make or model. We have an ever-changing inventory that is certain to include the vehicle that you are seeking and if for some reason we don’t have what you want on-hand we will track it down for you and let you know as soon as it arrives. The Audi A4 is offered as a sedan or a wagon body style to give customers the ultimate in convenience, versatility, and uncompromised performance and styling. Used Audi A4 sedans or wagons feature turbocharged engines and quattro® All-Wheel Drive for an inspired and confident driving experience. The cabin is clad in high-end finishes such as a leather-wrapped steering wheel along with aluminum and high-gloss accents throughout. The best thing about finding the used Audi A4 that you are after here at Barlow Motors is our easy to use online finance tools that take the guess-work out of the entire car-buying process. Here at Barlow Motors we offer user-friendly online finance tools that take away unwanted time spent at the dealership finalizing the details of the deal. Shoppers can use our trade-in estimator in order to find out how much their current car is worth and then apply for online credit approval so they know exactly what a used Audi A4 from Barlow Motors will cost them.